A super easy and Spicy Tomato Sauce that gets a ton of flavor from salty pancetta. Make it ahead of time, reheat and serve over cooked pasta for a quick weeknight meal! 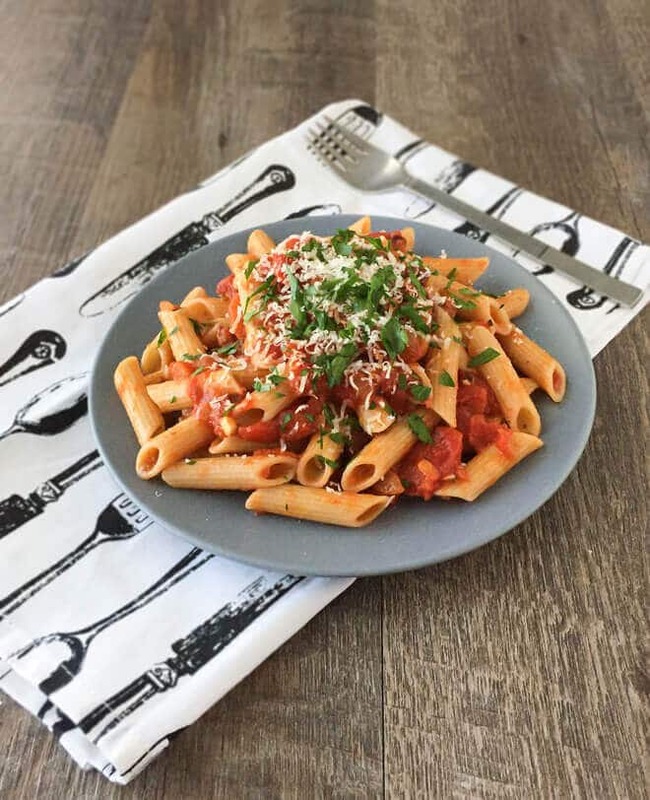 Today’s recipe is a quick tomato sauce recipe that has a ton of flavor with very little work. It’s a Martha Stewart recipe that I adapted. You can make this ahead of time and just reheat for a quick weeknight meal. It also freezes beautifully. I didn’t really feel much like cooking last night, and it was super nice to have this Spicy Tomato Sauce on hand in the freezer. I had some Italian sausage in the fridge already, so I just cooked that up and added this sauce to it. Boiled some pasta, tossed it in the sauce, added some Parmesan cheese and dinner was done! Having tomato sauces like this already made up can make your life a whole lot easier during the week. You can have tasty and healthy meals made with real food ingredients during the week just by planning ahead some. 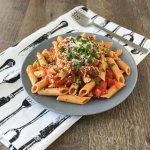 Pasta sauces like this can be used to make a simple pasta dish or even a soup like my Italian Sausage Soup with Potatoes and Zucchini. They can add so much flavor to soup and make a weeknight meal taste like it took a lot longer to make. If you can’t find pancetta, you could substitute some bacon in this recipe. The end result will be smoky in flavor. Pancetta is a cured but not smoked meat, so the flavor will be different depending on which you use. Either way, it’ll still be tasty. Our local butcher sells some really good pancetta that they make in-house, and I almost always get some if they have it when we go to buy our meat for the month. In a medium pot, heat the oil over medium heat. Add the pancetta, let cook, stirring often, until the fat has rendered and the pancetta is golden brown. Drain all but about 2 tablespoon of grease. Then add the onion and let cook, stirring occasionally, until they are tender, about 5-6 minutes. Add the Italian seasoning, garlic powder and crushed red pepper flakes. Stir in the chopped tomatoes with their juices and sea salt. Let sauce simmer gently, occasionally stirring, until sauce has thickened, about 25 minutes. Serve over cooked pasta shape of choice.